The words "boom town" conjure up images of the wild west, of tumbleweed blowing through the dusty streets of some forlorn cow town on the western plains. But the "old east" has had its share of boom towns come and gone. 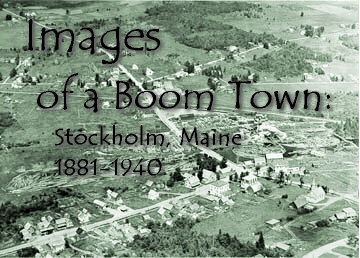 The little town of Stockholm, Maine, located in the furthest reaches of the State's northeastern borderlands, was one such community. Founded at the end of the 19th century by Swedish immigrants spilling over from the neighboring colony of New Sweden, Stockholm began its existence as a sleepy farming town. The arrival of industry in the form of lumbermills in 1900 transformed the community into a thriving company town and diversified its ethnic population through an influx of French-Canadian mill workers. The onset of the Great Depression doomed the lumber industry in Stockholm, however, and the removal of the mills in the late 1930s spelled the end of the community's boom years. Today, Stockholm, Maine exists much as it did in its early years, as a small farming community which continues to take pride in its Swedish roots. The only tangible reminders of an earlier era are an old stone foundation near the riverbank, and a rich collection of photographs of life as it was. To view the photo collection, click on a subject heading at right. Be sure not to miss the home page of the Stockholm Museum, real life home of the photographs in the collection.